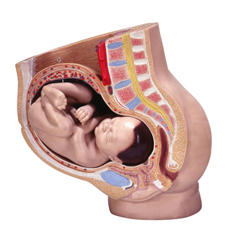 The Webster Technique helps support healthier pregnancies and more natural births by establishing optimal pelvic alignment by correcting sacral subluxations or misalignments. This technique has often been described as a breech turning technique, but it is a specific assessment and adjustment given to enhance the neuro-biomechanics of a person as defined by the International Chiropractic Pediatric Association (ICPA). It was developed by a chiropractor and ICPA founder Dr. Larry Webster as a means for helping pregnant moms assume a more naturally aligned and balanced pelvis. Dr. Webster was a pioneer in the development of adjusting children and a visionary when it came to adjusting pregnant moms. He was often called the Grandfather of Pediatric Chiropractic. “I had the pleasure of seeing Dr. Webster adjust pregnant women and learn firsthand how his technique works before his passing in 1997. He was passionate about the necessity of chiropractic care for children and taking care of pregnant moms. I feel privileged to have learned from him,” says Dr. Stacy Gray. With the growing amount of interventions pregnant women are exposed to during pregnancy and birth, more and more women are seeking to have more natural childbirths. The Webster Technique aims to help establish realignment of pelvic balance through a chiropractic adjustment thereby removing tension in the pelvic muscles and ligaments. This restoration of normal biomechanics in the mother allows babies to optimize their positioning on their own — naturally! Establishing pelvic balance and alignment gives babies a greater chance of moving into the correct or best position for birth and averting the crisis and worry associated with breech and posterior presentations. Optimal baby positioning also reduces the potential chance of dystocia or difficult labor, and this helps to result in easier and safer deliveries. Dystocia has been attributed to the misalignment of the mother’s pelvis and if not balanced it is much more difficult for the baby to move through the pelvis. Pelvic misalignments put undue stress and tension on uterine muscles and ligaments which ultimately impairs the baby’s ability to get in an optimal position and move through birth canal. As a prenatal chiropractor, Dr. Gray uses special techniques and has table modifications to ensure there is no unnecessary pressure on the abdomen of a pregnant moms’ belly. The Webster Technique is non invasive and involves two steps. Dr. Gray will palpate or feel the spine and pelvis to establish relationship of the bones of the pelvis and sacrum checking for misalignment or subluxation. If subluxation is present, a correction using a light force chiropractic adjustment to the sacrum on a specially designed chiropractic table will be performed. The second step involves analysis and light contact to a supporting pelvic ligament; most often it’s the round ligament. Both of these steps make up the Webster Technique and are intended to provide optimal pelvic alignment, and balance and help restore function in the pelvis. At no time does the chiropractor attempt to change the position of the fetus as is done in the medical procedure external cephalic version (ECV). “In my practice, I perform this technique on all my pregnant moms starting in their second trimester because it often helps reduce the pain associated with a growing belly and takes the strain off the pelvic bones and ligaments,” says Dr. Gray. Chiropractic care during pregnancy can help ensure pelvic balance and gives babies the best chance to move into the correct position for birth. When women are under regular chiropractic care during pregnancy, complications can be prevented. Dr. Stacy Gray has a special interest in in serving pregnant moms and has taken additional training and achieved certification of the Webster Technique and the designation of CACCP from the Academy of Chiropractic Family Practice. Her 200 hours of post graduate specialized training in caring for pregnant women and board certification in pregnancy, pediatrics and the Webster technique has given her the clinical expertise and competence for the care of pregnant moms. If you’d like to experience the benefits of chiropractic care during pregnancy, book an appointment today at Gray Family Chiropractic!